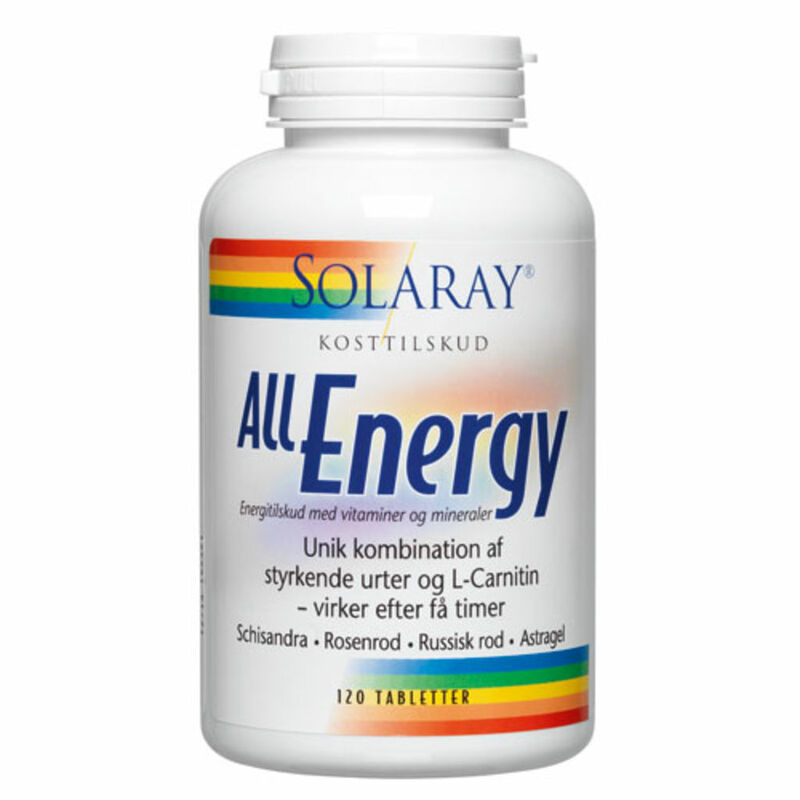 Med L-Carnithin, vitaminer og mineraler. 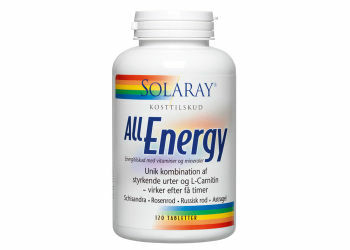 Solaray All Energy er et tilskud med vitaminer og mineraler i tabletform. Solaray All Energy indeholder desuden en kombination af urterne Schisandra, Rosenrod, Russisk Rod og Astragel. Anbefalet daglig dosis: 2 tabletter med rigeligt væske. L-Carnitin (L-Carnitin-L-tartrat), Vitamin C (L-Ascorbinsyre), Niacin (Nikotinamid), Vitamin E (D-alpha-tocopherylsuccinat), Pantothensyre (Calcium-D-pantothenat), Vitamin B6 (Pyridoxinhydrochlorid), Riboflavin (B2) (Riboflavin), Thiamin (B1) (Thiaminmononitrat), Vitamin A (Retinylpalmitat), Folsyre (Folsyre), Biotin (D-Biotin), Vitamin D3 (Cholecalciferol), Vitamin B12 (Cyanocobalamin), Jern (Ferrofumarat), Zink (Zinkgluconat), Mangan (Manganogluconat), Kobber (Cuprigluconat), Jod (Kaliumjodid), Selen (L-selenmethionin), Chrom (Chrompicolinat), Molybdæn (Natriummolybdat), Rosenrod rodekstrakt (Rhodiola rosea L.), Schisandra bær (Schisandra chinensis (Turcz.) Baill. ), Russisk rod rod (Eleutherococcus senticosus (Rupr. & Maxim.) Maxim. ), Astragel rod (Astragalus membranaceus (Fisch. ex Link.) Bunge), Stabilisatorer: Mikrokrystallinsk cellulose, hydroxypropylcellulose, magnesiumsalte af fedtsyrer, siliciumdioxid. Antioxidant: Tocopherolrig ekstrakt. Farvestof: Chlorophyllin-kobber-kompleks. Overflade-aroma: Pebermynte.